Popular legend has it that Irish Coffee was invented in San Francisco, but, of course, it was invented in Ireland at the Shannon Airport. Which was the first place transatlantic flights landed when planes started flying across the ocean, their destination being Ireland. I’m sure the trip took a lot longer than it does now. But it easy to see why the Irish Coffee was popularized 5000 miles away, although going to the source is the kind of adventure I’m always up for. 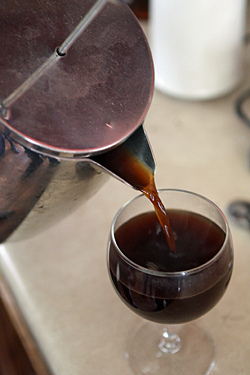 And when you’re in Ireland, and an honest-to goodness Irish lad, whose mum is a cheesemaker) offers you a drink, even if it’s barely 10:30 in the morning, one could reason that since it’s coffee-based, then it’s fine. Which I did. However when I saw that giant jug of Irish whiskey come out, and tasted my first sip, it was easy to see why Irish eyes are always smiling. 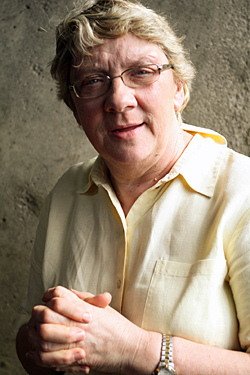 Mary Burns has been making cheeses at Ardrahan Farmhouse Cheese for over thirty years, and is a love of a woman. We had dinner the first night I’d arrived, and I just wanted to give her a big hug. 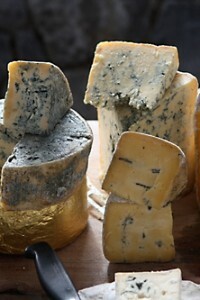 She’d told me about her cheeses, but also that she made Lullaby Milk, a high-melatonin milk that’s said to help sleep. I was so excited to see Mary’s cheesemaking operation and by the time we said goodbye a few days later, after I visited her home and dairy operation, I was ready to serve her with my adoption papers. Yet Mary’s already got a son, who she may not want to part with since he’s responsible for the early morning milking of the cows for her cheeses and I am rather unpleasant in the early morning hours. When we got to her home a few minutes too early, the milk was resting, not quite ready to curdle for the cheese, which she said wasn’t so exciting (it’s likely like watching grass grow), so she invited us into her country home for a spot of tea, or coffee. 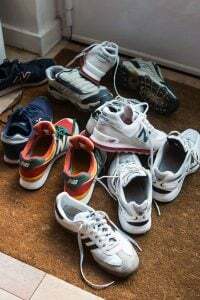 At that moment, her son, Gerald, came bounding down the stairs, looking flushed from his morning milking duties—or a post-pulling nap, and offered up his famous Irish Coffee for me to try. For some reason, there were few other takers in the group. But since it was nearly 11am, and I desperately needed a bit of caffeine (plus I didn’t want to be rude, of course), I took Gerald up on his offer. And besides, I was still on Paris time, meaning that it was noon. So that makes it okay. 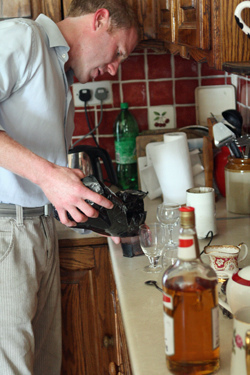 So how does a true Irishman make a real Irish Coffee? It starts with Irish whiskey. A very big bottle of Irish whiskey. 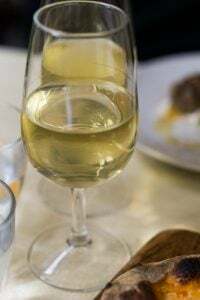 And once I saw him pour it into the glasses, filling each up halfway, I see why they buy the bottle in the handy 1/2 gallon size. “No need to use the good stuff” he told us, when someone asked if the brand was that important. And I could see how easily one could move from a cheese house to the poor house with such a generous hand. Next up was the coffee. Although the coffee culture has hit Ireland and shops have opened in the towns and cities, in most homes I visited, instant coffee is still served. Which may be because Ireland has such a strong tea culture and coffee isn’t given much due. But for round two (I would recount what happened to round one, made with instant coffee, but I don’t remember), he went for plunger-style coffee, which was really much better. 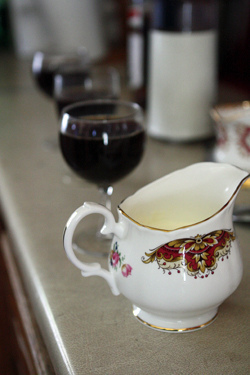 After filling the glasses with the steaming coffee; and glasses are always used, never mugs—a small bowl of rich, whipped Irish cream was spooned over the top and formed a mousse-like seal, letting the coffee and whiskey warmly mingle underneath it all. A few shavings of coffee beans, I think, got scraped over the top, and I was handed my second Irish Coffee, which was better than the first. 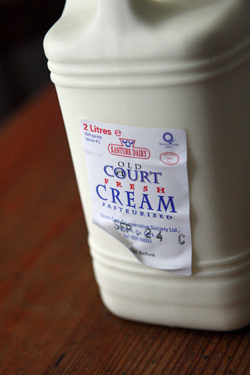 So do whip that good Irish cream, and skip the instant coffee. And if you don’t get it right the second time, you can try it a third time, until you get it right. And I speak from experience, if I remember (correctly). 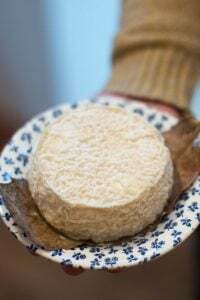 Mary Burns’ Duhallow cheese, is made right beside her charming home from milk that is produced by her own cows, even though it’s sold across Ireland, from small farmer’s markets to Costco. All the production takes place in a building the size of a basketball court, with clearly marked rooms for production, storage, ripening, and packaging. 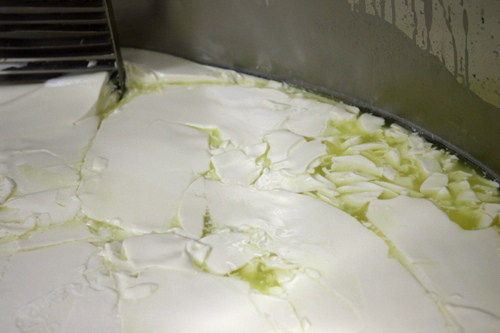 Dressed in green wellies and protective gear, we were led into a hot, steamy room, which smelled of dewy-soft curd, where the milk in the large stainless-steel tanks was finally ready to be broken up and separated. 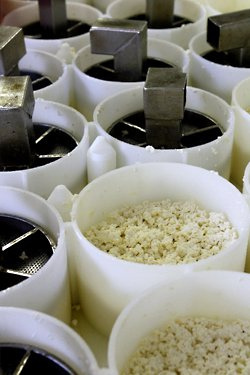 Even though some of the cheeses are sold on a large-scale basis, everything was done by hand (or shoulders, judging by all the scooping, draining, and lifting) and the slippery solids were scooped out and poured into round draining containers, where each is allowed to sit for four hours. It was hard to imagine the cottage cheese-like, firm curd eventually becoming a solid, creamy cheese. And if I hadn’t seen it myself, I might not have believed it when I touched the rubbery nubbins of milk curd for myself. 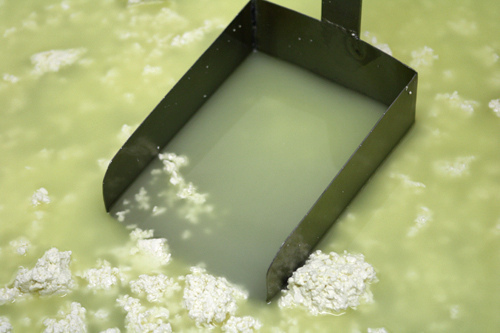 A metal press is placed on top of the curds and at first, there is a huge rush of liquids flowing out of the bottom. Then it tapers off to a gentle trickle. The racks are stacked up and left to rest for four hours. 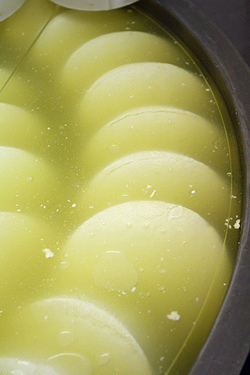 Once finished, the cheese rounds are unmolded, then brined briefly before being wheeled into another room and left to dry and ripen on open racks, until they’re ready for sale. After lunch, Mary brought out all her cheeses and we tried them. 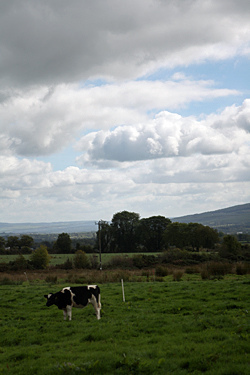 I wasn’t quite ready for yet another Irish coffee, but looking out at the cows grazing just nearby, where she gets the milk for her cheeses, I could certainly help myself to another slice of Irish cheese. 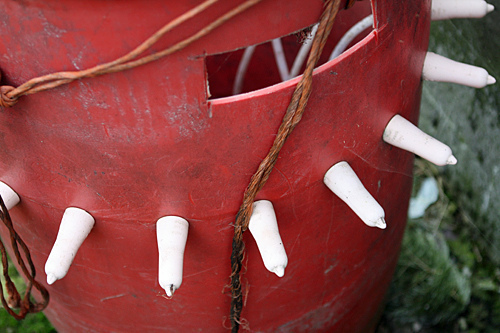 I didn’t ask if it could be rigged up at home, for perhaps serving drinking Irish Coffees in greater quantities, but I’d probably get some odd looks from my neighbors if they saw me wearing high rubber boots and wheeling it down the street. So I’d better stick with serving beverages in glasses. I’m doing my PhD in Sociology at the moment, so I can firmly state that “mealtimes” and “appropriate foods for certain times of the day” is simply a social construction and we can all eat whatever we want whenever we want, because the only reason we don’t is becaused we’ve been socialised into thinking that doing so is deviant. In other words…. pass me the cheese. It’s 6:30pm in Australia and I want a wheel of cheese for dinner. 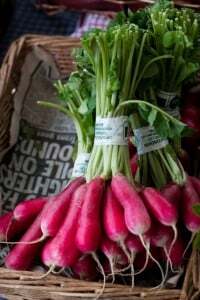 I just moved to Dublin from the US a few months ago, and as a regular reader of your blog I am so excited to see some posts about Ireland and Irish food. I am crossing my fingers that you’ll visit Dublin so I can read about your food finds in the capital city. You sound like you are enjoying your trip to Ireland :-) Ardrahan is a beautiful cheese – what a treat for you to see where it’s made. Ah, my favorite cold weather drink. Delicious! Thanks for the beautiful pictures and stories. I always look forward to reading about your adventures. My boyfriend’s grandmother first cooks the whiskey in a pan and adds 3 spoonfuls of sugar for every glass to the pan. Not a huge fan of Irish whiskeys but to me the more sugar, the better. Pictures of cheese-making remind me of my childhood fascination with World Book Encyclopedia’s entries on cheese and other fun stuff. 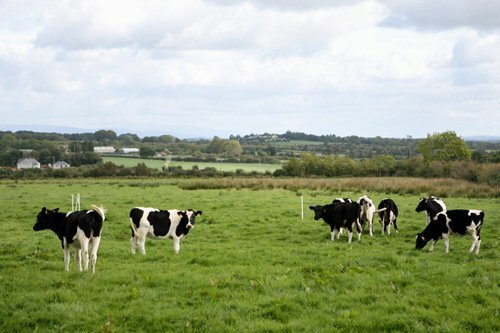 On my last visit to Ireland (a long time ago) I remember that the cows seemed extraordinarily large, like cows from another planet….true? Does this farm export any cheese to U.S.? Got so much blog reading to catch up on! That Irish Coffee would fairly give you a boost in the morning! Your pictures make me miss Ireland. I went there two years ago on vacation and loved every minute. 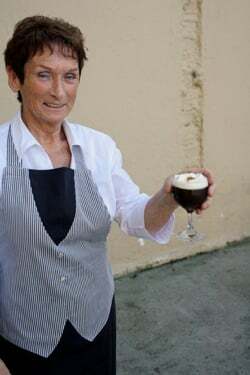 Interestingly, my first Irish coffee was not in Ireland..I was a lot younger and visiting my dad’s friends in Australia. They all got together at a restaurant and talked and talked for hours. They were all older and nothing they talked about was interesting to me, I was bored out of my mind and I just remember nodding my head, smiling and trying not to fall asleep when the lovely lovely lovely waitress came up to me and asked if I’d like a coffee. I nodded yes and she looked me over and said “dear, would you like a coffee, or a Coffee?” Of course I picked the second one, and she brought me was a glass of “coffee with a bit of Irish in it”. I think I had three, but the rest of the evening was much more bearable. Oh, did I mention that I was 17 at the time? David, just wanted to simply say that I love your blog. This story is such a lovely example of your enthusiasm about food and travel, which is what keeps me coming back, post after post after post. Thanks so much for sharing your adventures with us! The Irish coffee sounds perfect. I’ve been trying to figure out a way to make it into a dessert, since I have an odd habit of turning drinks into desserts. I’ve been leaning toward some kind of pie. Or maybe ice cream. I simply love your Ireland posts! 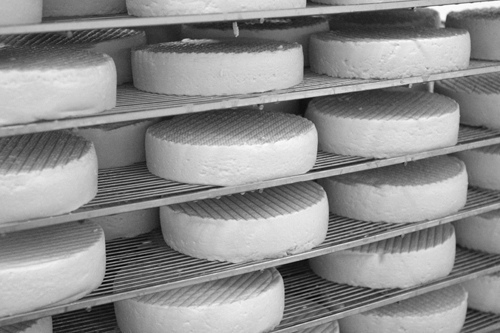 It is so good to see people making great cheese still by hand. But I’m still wondering if you’re going to maybe try drinking a guiness and chasing it with that whiskey! Maybe following it up with some colcannon? Looks like a lovely trip, can’t wait to see more. Enjoying your posts on Ireland. We recently got back from a week there. Didn’t have an Irish coffee, though. But, trust me, we made up for it in pints of the black stuff. I’ve always wondered about the glass… why a glass and not a mug? I suppose putting that much alcohol in a pretty little teacup wouldn’t do. In any case, it looks wonderful at any time of day! I second Hannah, plus, there is no such thing as a time not convenient to taste cheese :D.
Yay \o/ , no more bug. damn, those machines are pretty touchy sometimes :). i’ve seen dedicated glasses for irish coffee with an included glass straw (made in one piece with the glass) to sip the coffee/alcohol first from below. I’ve always wondered if they were traditionnal, but now I think that they were something custom made by/for the bar tenders :D.
How fun! The coffee looks great and I’m sure it tastes as good. With that for breakfast and Guinness as lunch, I’m starting to think to I should move to Ireland! Oh, wow! 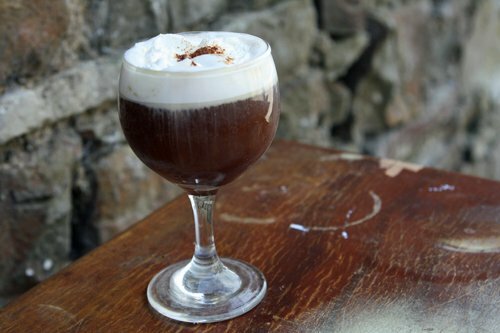 I could certainly use a proper Irish Coffee now–I’m salivating after your descriptions and those gorgeous photos! Your travel/food blogging is incredible. Fun, witty writing with amazing photos! 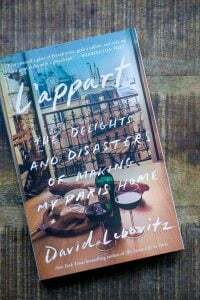 This trip in particular is so excellent~Lebovitz at his best. Thank you! My Irish husband would love this; not so much because of the coffee but because of all the liquor that goes in it. It looks just lovely! Love all the background info. You do the most interesting things when you travel. How I envy you! Never been to Ireland, but would love to go. This is the kind of activity that I would enjoy as well. 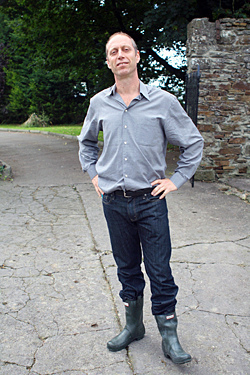 David, you look so fetching in your green wellies! 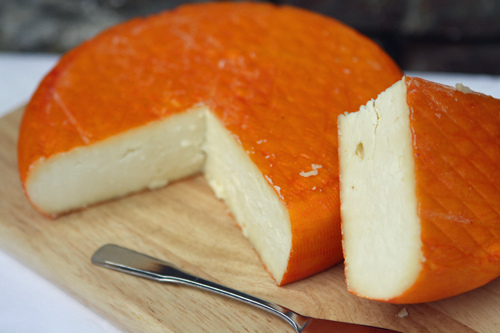 I’ve had the pleasure of tasting Mary Ryan’s cheese while on culinary caravan through Ireland a few years back; how could anyone resist that beautiful honey-orange rind. For my Irish coffee only Bushmills will do. Another great post. Thanks, David. Your posts are the first things I read — as soon as I see them in my inbox. Your descriptions make me feel as if I’m right there with you, and the photos are always stunning. (What kind of camera do you use?) Carry on !!! 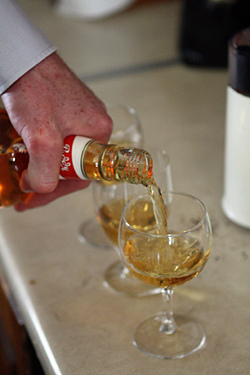 And if I do add the booze-only Jameson 12 will do. Hello David – as a newcomer to your site I just wanted to pass on how much I am enjoying your writing – your recent New York posts were the first I read and I loved them – I have visited NYC twice and just love it so really enjoyed reading of your trip there – I also like the blend of cooking and travel and the little tips and insights you offer for the different places you visit……..thanks so much…. I enjoyed seeing the picture of the ‘calfeteria’. This has been an fascinating series on Ireland. 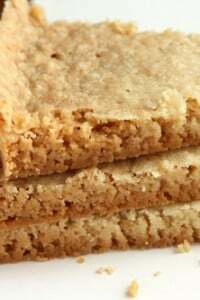 Going back to the butter one, I have on occasion used the Irish one you featured and discovered it tends to have a more spreadable consistency (and sweet!) even directly from the refrigerator – whereas Plugrá is always harder (imagine my surprise learning this one is not French-made, even though the name suggests it is) – my favorite that I used to be able to buy here in New England was a round, flat butter in a paper wrapper that – but, the store no longer carries it. It had tiny, sea salt crystal that made it absolutely fabulous. By the way, is it just my computer (Firefox) that has been crashing regularly when I click on the hot link to continue one of your features? Agggggh! I reported it today to Firefox, but is it the browser or something still not operating smoothly with your new behind-the-scenes site changes? 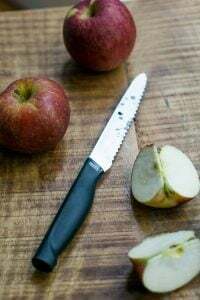 David, I absolutely love your blog, you have a great sense of humor and obviously a great passion for all things edible. 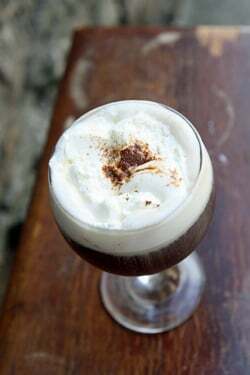 It’s barely 8am and I’m craving for a nice glass of Irish Coffee. That if something is a compliment for your great posts! Enjoy your time in Ireland. Would love to visit it myself. Hi David – I have been reading your blog through my Google Reader for months now, and I have come to look forward to your posts. Very clever writing, and the pictures are always beautiful! What kind of camera and lens to you typically use for your food/drink pcs? How do they come out so wonderful all the time? 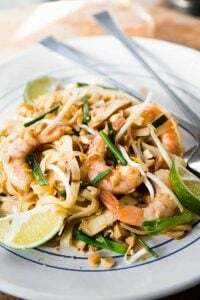 Hi Brian: I did a post on My food photography gear which explains a lot. They weren’t making coffee with the holy water, but I liked the bottle! 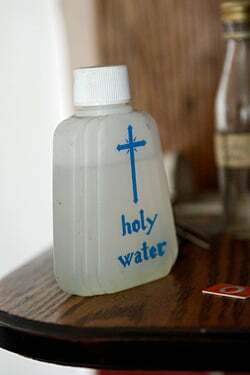 I was curious about the holy water, too. lol. Irish coffee has be one of my top 3 favorite drinks. I love how the gentleman you were with said not to fuss about the brand. 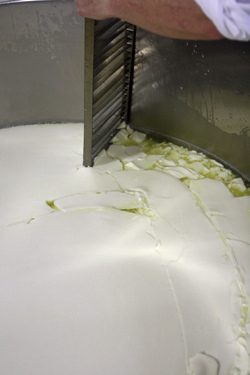 Thanks for sharing the cheesemaking process – very interesting. Beautiful photos. I’m revisiting my memories of Ireland. 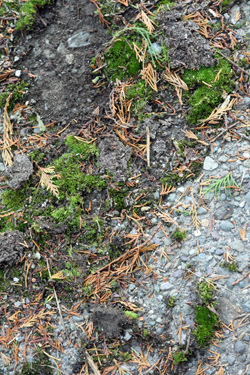 Kudos on a charming post! It was an enormous pleasure to read–thank you for sharing. Irish Coffee was invented not at Shannon airport, but at the Foynes Sea plane base that was across the Shannon River from the airports current location. The local bartender created Irish coffee one frigid night when passengers had be just brought in from a Sea Plane and needed to warm up. It was popular at Shannon Airport when it was built after the war. 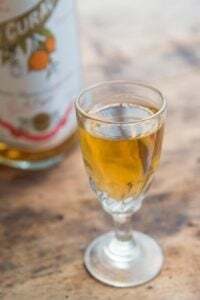 It became sensational when San Francisco Travel writer Stanton Delaplane wrote about it when he was in Ireland and then almost died helping the bartender at the Buena Vista perfect the recipe. In San Francisco it became world famous. Had a severe moment of jealously. That never happens to me! Now I’m looking for flights to Ireland. OMG You continually crack me up David. I’m having my morning coffee – before I go and take a pick axe to the soil in the garden – and you’ve given me fortitude!!! Hilarious. (I thoroughly enjoyed your book too btw). 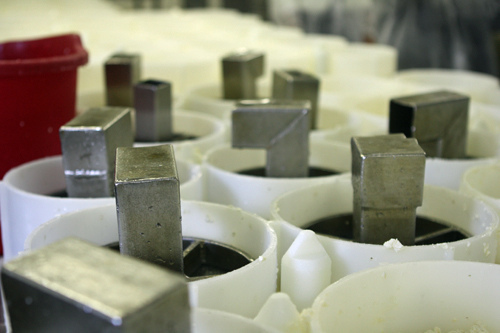 In your photo above, the cheese is being shaped and pressed in plastic containers. Is this typical? Yes, I believe it is standard now to use plastic and is likely an European Union directive.